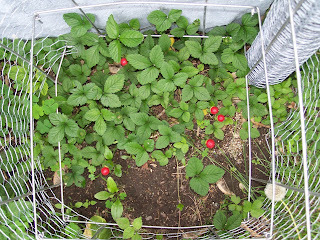 There are a ton of strawberries growing in our yard. They sent out vines and keep popping up everywhere. I was fortunate to find this little clump before the critters got to it. I put down a tomato cage and wrapped some chicken wire around it to try to save it. We will see what happens. This sums up my life right now to a tee!